The Hundred Cat Foundation (HCF) is a non-profit organization whose mission is to improve the lives of feral, stray, and free-roaming cats in the Centre County, PA area and to assist the people caring for these cats. We do this by providing access to low cost spay/neuter services, assisting people caring for colonies, providing nutritious food, and providing outreach and education on feral and stray cat management. Trap/Neuter/Return (TNR) is a humane method of reducing the population of feral, stray and unowned roaming cats over time. Feral and stray cats already living outdoors are humanely trapped, evaluated, spayed or neutered, and vaccinated. The population of the colony is reduced naturally over time. A true feral cat avoids contact with humans if at all possible. They tend to live on the edges of developed areas, mainly come out to feed at dusk, and tend to live in groups or colonies with other cats. A stray is usually more "domesticated" in that it will approach people, feed close to a house or other building, and may even allow humans to touch him. Why should people care if feral or stray cats are spayed or neutered? All unaltered cats contribute to the pool of kittens and cats that are euthanized at shelters every day. Unaltered male cats tend to fight which can spread disease. Intact females run the risk of developing uterine infections and other health problems. Kittens born to feral or stray cats are much more likely to die before reaching adulthood. Altering can prevent much unneeded suffering, improve the lives of these cats, and reduce the number of cats in shelters who are euthanized or compete with cats already in shelters for homes. 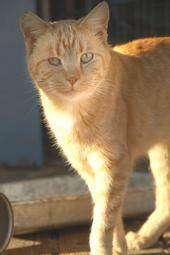 Feral cats are often vilified in the media and by wildlife groups. Click on the picture to read our position on feral cat management.